• 865 sqft , 1 bath , 3 bdrm 2 storey – FOR SALE CAD164,900 . 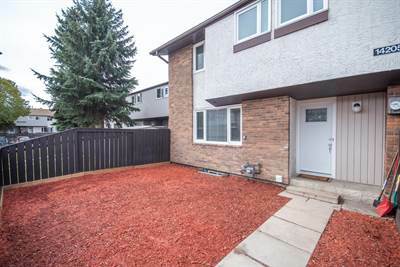 Welcome to this fully renovated 3 bedroom townhouse in a super convenient location close to transit, shopping and more. This move in ready home features new vinyl plank flooring on the main floor that accents the freshly painted walls giving you a bright modern living space. 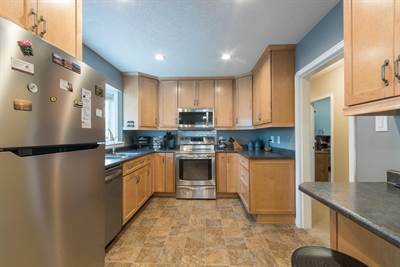 The updated kitchen includes new doors with transferable 5 yr warranty, new counter top, and stainless steel appliances. upstairs you will find hardwood flooring in the hallway and master bedroom, upgraded carpet in the bedrooms and on the stairs. That same plush carpet is in the basement L shaped recreation room — the perfect place for a gaming room, theatre room or play room still leaving ample room for storage! New hot water tank too! Complex has recently had windows, siding and roofs done, and the board cares enough to have on-site security patrolling the complex to ensure safety for everyone. Check it out today! in Meadowlark Park, Edmonton Announcing a price drop on 15909 93 Ave NW, a 1456 sqft , 3 bath , 5 bdrm single story. Now FOR SALE CAD399,000 . Reduced!